This sandwich is spiced up with Indian flavours - enjoy the heat from the hot curry paste, then cool the palate with a refreshing yogurty raita. In a large bowl, mix together the meat and curry paste. Thread the steak, chillies and tomatoes alternately onto 4 skewers and grill under a high heat for 5 - 8 minutes, turning from time to time until well browned but still a little pink in the centre. Meanwhile, coarsely grate the cucumber and mix with the yogurt. Cut the lemon into six wedges, save four for serving and squeeze the juice from the remaining two wedges into the yogurt and add salt and pepper to taste. Remove the skewers from the grill and briefly warm the bread under the grill. 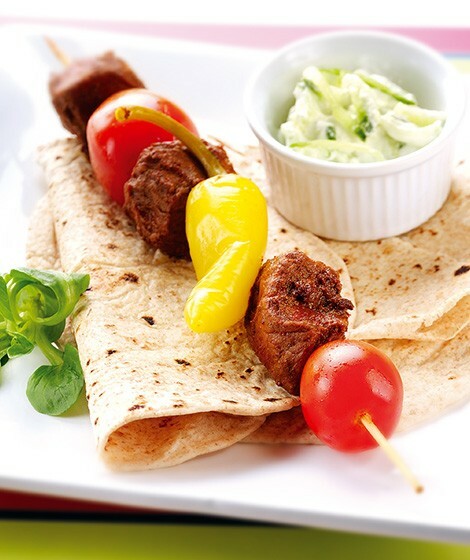 Place a skewer on each chapatti, drizzle over the raita, add a wedge of lemon and serve open-style. Alternatively, place a skewer on each chapatti, roll up, slide out the skewer and cut each roll in half. Arrange two halves on a plate with the cucumber raita for dipping and a wedge of lemon. Cubed chicken would also work very well in a wrap like this and try adding a spoonful of mango chutney along with, or instead of, the raita. Chapattis are usually made with wholemeal flour but wholemeal flour tortillas, though often slightly larger, make a very good alternative. Pickled chillies are available from supermarkets in jars and are mild enough to eat whole.